Simplicity that encourages use in almost any fashion context is what the wearer gets with this plain hollow cross pendant. There are hardly any unnecessary frills that demand specific use and as such, the possibility of committing fashion gaffes is limited. 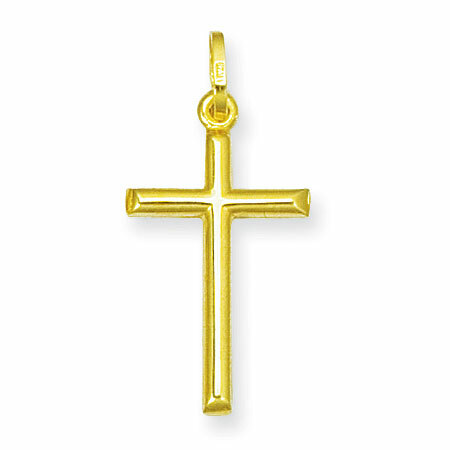 It is crafted from 14 Karat yellow gold and simply follows the popular design of the cross but with small hole at the top into which a rounded hook is inserted where it will be strung onto the necklace. Its dimensions are 33mm x 16mm. This pendant maintains its yellow gold throughout and by so doing, consistency of design and beauty. We guarantee our 14K Yellow Gold Plain Hollow Cross Pendant to be high quality, authentic jewelry, as described above.